Yesterday, two separate people - one by text, one in the comment on my latest blog (hello Fnarf!) - asked me how much of the Northern Rail map I've actually done, and whether there was a map anywhere with all the ones I have still to do. In light of this unprecedented public interest in the blog (no, seriously; most of the time it's tumbleweeds around here) I thought I'd do a little post answering those questions. I'm not going to do it in map form though. That map, with the stations crossed off on it, is for my eyes only. We have to have some secrets, dear reader. Plus I don't want you turning up at the stations I have yet to do, screaming in adoration and trying to get my autograph. Yep. I'm in the last quartile of the Northern Rail map. (Please note these numbers include four stations I visited last week and haven't written up yet - cliffhanger!). That doesn't mean I'm nearly finished, because that's still 130 stations to be visited, many of which have terrible service, or are in the wilds of England, or are probably a bit unpleasant to visit. There's also Dalegarth, the heritage railway in Cumbria that I don't particularly want to visit but which Northern added to the map for reasons unknown to any sensible humanoid. The "total" is constantly in flux. James Cook University Hospital was added to the list last spring; work has just begun on two new stations in West Yorkshire, and Ilkeston station in Nottinghamshire is due to open at some point. Northern - or their replacements - may also lose some stations in the new franchise, like the ones on the Grimsby line. You want it broken down a bit more? How about a list of how much of the map I've done, split up into Public Transport Executive? Again, this gives you a bit of an idea of the geographical stretch I still have to do. A bit of town, a bit of country. I like to keep things mixed up and spread over a wide area - for example, at one point I realised I'd done an awful lot of West Yorkshire in a short period of time, so I laid off there for a while. It keeps things interesting for me, and hopefully for you as well. Fnarf also suggested that I'd get some kind of ceremony when I did the very last Northern station. I believe the phrase is, "LOL". Merseyrail didn't do anything for me after I visited all their stations, and they were lovely to me most of the time (I went to their Christmas party!). Northern wouldn't even send me a map for my wall when I asked them. I'm not counting on a 21 gun salute. I will probably get drunk, though. I can understand not wanting to go all the way up to Ravenglass again, but the Ratty line to Dalegarth is fantastic - great scenery, lovely little trains. Perhaps it would be less good on a miserable day, but I'm busy waiting for an excuse to go back and do it again. I think you should keep the last one to yourself or share it with close friends, but make the penultimate one a major station, or repeat a major station, so that those of us actually in the north can meet, congratulate and thank you. Of course with another 130 to go you may be heartily sick of both station bagging and blogging by then. Yep Scott, as above, be great to meet and congratulate you at the end, and thank you for a great blog. Maybe, just do Lime Street again, then we can all get a drink! I don't comment on all your post's, but think your writing is great, I'm sure somehow, this could be made into a book. 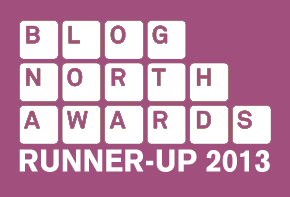 'Bump' on the above posts - I'm sure there are many lurkers like me who enjoy reading this and would like to celebrate your success near the end, although whether you'd be inclined to meet the sort of people who read train blogs is another matter! Your post at the end of December reckoned that you got 136 stations in 2013 so with 130 to go that could put you in a position to finish this during 2015. I look forward to the Arram blog! I've just counted up how many stations I've visited on the Big Tile Map, and it's a mere 104, out of *insert ludicrous vast amount here*. Too late, I've already done your map. I only started reading about three years ago, and I somehow missed the map you did with the stations crossed off back about a year ago, so I've rolled through all the posts in record time and put them on google. I won't share it, though, to protect your privacy, and I'm 5,000 miles away so the chances of turning up at Hebdon Bridge or wherever you finish up are pretty small. Maybe if you keep at them Northern will at least send you a pair of branded flip-flops. Oh, I know what you're going to do. You're going to say to yourself, well, I'll just stop in at Thirsk, even though it's not Northern, because after all it IS "northern", and the next thing you know you'll be doing all the East Coast lines, and it'll just carry on until you finally roll your Zimmer frame up to get a shot of the Last Station in the United Kingdom, at Prittlewell or some place, at the age of 82, and fall over into a puddle.